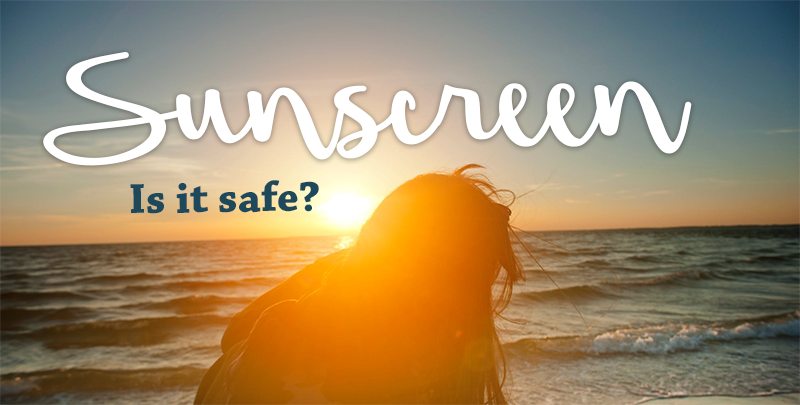 Sunscreen - Is it Safe? With summer in full swing, it is important to remember each sunscreen is different. There are many brands, types and ingredients; and with something that we put on much of our skin, we should all be aware of the best ones to use and ones to avoid. Sunscreen’s active ingredients may be minerals, chemical filters or even both. So, which one is the best? While they each have their own pros and cons, mineral based sunscreens use titanium dioxide and zinc oxide. These active ingredients go onto the skin but do not absorb completely into your blood stream. Mineral sunscreens provide the best protection as they do not break down in the sun and is a great protection from UVA rays. The second group of sunscreens use a chemical filter as the active ingredient and contain 2 or more of oxybenzone, avobenzone, octocrylene, and so on. These ingredients are absorbed into the skin with measured amounts found in your blood stream, breast milk and urine. CDC data suggests that the ingredients in the chemical filters can also affect hormones. Oxybenzone exposure has been found to lower testosterone levels in adolescent boys. It is also known to shorten pregnancies of male fetuses and lower birth weights for girls. The third group say they are mineral-based but they are coated in the chemical ingredients listed above, so make sure you read the label! One additional ingredient that is sometimes added to sunscreen that can be harmful is Vitamin A. While this ingredient has it great benefits in other forms, when it is added to a sunscreen, it can form into small molecules call free radicals which damage DNA. Make sure your sunscreen, moisturizers with SPF and lip products do not include Vitamin A as an ingredient. Is a sunscreen higher in SPF better for you? Not necessarily. SPF 100 sunscreen indicates you should be able to be out in the sun for twice as long, before you start to burn. For example, if you burn in 30 minutes, you should be able to stay out for 50 minutes. However, using SPF to pick the best sunscreen is misleading. SPF does not protect you from all the rays. It does help protect you from ultraviolet B (UVB) rays but not from ultraviolet A (UVA) rays. UVA can penetrate your skin much deeper and cause more damage than the UVB. By using a higher SPF, people tend to think they can stay out in the sun much longer, but this causes much deeper skin health concerns. One last thing to remember before you buy that sunscreen! The FDA regulations have been grandfathered in from the 1970s. That was almost 50 years ago and we have learned many new facts about what we put on our body so it is very important to research which sunscreen you purchase this summer. For a look at which sunscreens are best, please go to EWG’ 2018 sunscreen report by clicking HERE.